Living in Miami, as in many other US cities, is living with the possibility of home invasion, car jacking, and assault. Chances are if you’re looking to own a rottweiler you’re interested in the breed based on its reputation to be protective of its home and people. The truth is just because a dog has a rottweiler’s appearance doesn’t mean it will protect. Appearance and reputation amount to nothing more than deterrent value. When that’s not enough to stop someone intent on doing you or your family harm the dog will be tested. At such time a dog that’s not genetically suited to protect may not even recognize a threat, or will choose to avoid a dangerous confrontation with a human. There are very specific qualities required for the dog to function as a protector. These qualities are not automatically included with a black and tan color and big head. Rather they run in certain lines of dogs and nowadays are pretty hard to find. Breeders who want to produce protective dogs, and have the experience to recognize the traits they must possess, look long and hard for such dogs to incorporate them into their breeding program. Dogs with show titles are almost guaranteed to not have the genetic potential for work. The requirements of winning in the show ring force a breeder to cater to the latest conformation trends, focusing on appearance instead of function, as a rule one will come at the expense of the other. Also producing docile dogs that never show aggression in the ring (show people don’t know how to control strong dogs to make them sociable). Dog shows produce pretty and at best healthy dogs, not protection dogs or even dogs with a character that will be a pleasure for you to share your life with. 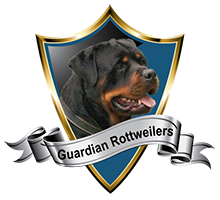 At Guardian rottweilers we breed only male and female rottweilers that have demonstrated capability in the protection field. We regularly test and work dogs employing a decoy, a person posing as a bad guy wearing protective equipment that the dogs can bite, recreating a situation where the dog will be required to react aggressively. Not only are the dogs tested for willingness to engage a human adversary, they are also expected to come under control and be sociable once the handler determines there’s no longer a threat. 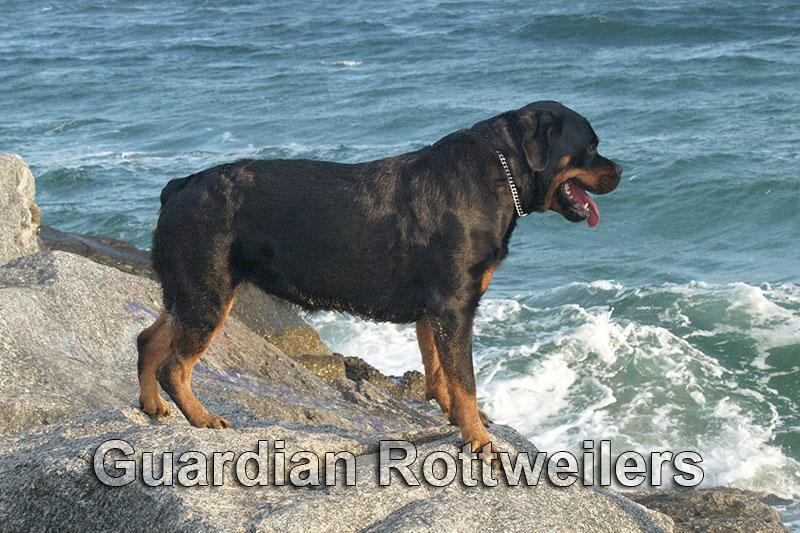 We aim to produce as large a percentage possible of Guardian Rottweilers in every litter of puppies. Such dogs require a time commitment, a strong experienced hand and training. Puppy selection is very important, as there is variation in puppies of every litter, and hardness and courage will not be pronounced in every rottweiler. Puppies that demonstrate a softer temperament are offered to loving homes that want a beautiful, healthy, and easier to manage rottweiler. Because we know our dogs best, if your goal is a protection dog it’s wise to let us help you choose a puppy from a litter, to fit your particular situation and needs.